I would not have any luck at all, at least when it comes to the fishing tournaments! Yesterday was our second day of fishing on the FBC Blanchard tournament trail and wow, what a day! First, a little background, I am not a fisherman in any way, shape or form. I like to fish and I somewhat enjoy it, but I am not good at it no matter how you slice it. Last year, our church expanded the increasingly popular tournament to include three days with an overall winner of combined weight. This year, we added a fourth date and drew even more teams into the tournament. The entry fees are split 50/50, with half going to payouts for prizes and half going to the churches mission work. The tournament rules are pretty simple, two man/woman teams, with a five string limit, you can fish any public water and have to be at the weigh in for each day. Last year I teamed up with a good friend and Sunday school class member who shall not be named to protect his innocence, ha ha. So he and I fished last year and teamed up again this year. Neither of us have much fishing experience nor have we fished much since our childhoods. He had a boat and could get away on the times of the fishing days and we were set. We bought some rods, reels, baits and set out to "fish". Sounds easy, but that is where the trouble began. The first date this year forced us to fish with my uncle as the barge was broke and the part was on back order. We went out, fished in the cold, grey, windy day and brought zero fish in, wasted day. This time, again, it was cold, grey and windy, but being the novices that we were, we decided to fish the Red River. MISTAKE NUMBER ONE! I knew it was a bad omen when the boat would not crank but did we listen, of course not, we are men and we are stubborn and want to have things our way. My friend insisted that we launch and we will "fix" the boat in the water. Ok, after a few failed attempts, we purchased a battery for the boat because it seemed to not be getting enough power. MISTAKE NUMBER TWO! Once the battery was in place and a few connections were double checked, the boat would still not turn over. Here we should have known that it was time to load up and head back but we, being thickheaded decided to go in the opposite direction. We decide to manually pull start the boat, and it worked! So with the wind blowing, sub zero temperatures and no clue as to where to go, we set out to find a spot to fish. Once we got into the channel and headed north, we found what we thought was an excellent spot, wrong, it was shallow, and we almost ran aground. Quick thinking by the two of us to throw the boat in reverse and push out with a paddle saved us some embarrassment and got us moving again. From here we pushed on and found a nice spot to drop anchor and do some fishing. A half hour later and no fish, we decided to move. We pulled the anchor up and got prepared to move. MISTAKE NUMBER THREE! Once the anchor was pulled, the wind pushed us across the channel and as we pulled and pulled and pulled on the motor. No luck, we tried everything we knew to do and finally realized that a battery cable had burned through and we had no power. No power, means no motor, no matter how it is started. Before we had a chance to react, we were pushed against a rock jetty and we were stuck. Thankfully we had cell phones and the number to the marina that we launched from. Forty-five minutes later the Bossier Parish Sheriff patrol boat came into sight and provided us with some assistance. We were towed back to the launch. How embarrassing, but the sheriff said it was not an uncommon thing and that they do it all the time. Not sure if that was true but it lessened the blow, a little. Tired, frustrated and cold we almost called it a day but I was not going to give up just yet. I had a back up plan, we had to catch some fish. So I called up dad, got permission and set sail to a pond in an undisclosed location. We arrived with a positive attitude and some hopes for at least one fish. All I wanted was one, to weigh in and show the others guys that we could catch fish. We fished the entire pond with only a few bites. I managed to pull two all the way to the edge of the pier only to have them get away. So with time winding down and our spirits almost crushed we decided to make one more round. I am glad we did not give in. On a whim I decided to change lures and bingo, it worked. On the first cast I caught a fish, on the second, the same result. I then asked my friend if he wanted one of the lures, he decided against it, until cast three. Another fish, I was on a roll. Now with us both fishing the same lure and time winding down we landed twelve fish. They were small but we kept a few for the weigh in. Once we had our fill and the fish slowed, we packed up and headed in to the weigh in at the church. Officially, we weighed in two fish, totaling just under two pounds! We laughed, as did others but hey we came in fifth place of twelve teams. It was a hard day all around, everyone fought the elements more than the fish. Ultimately, we had a good day and I won a nice door prize as I got a bass pro gift card. I will be sure to use it to buy some more of those bass killer lures. Who knows, maybe next time it will be warm and the boat will behave! Next time, we will catch some fish, maybe some of them will be noteworthy. 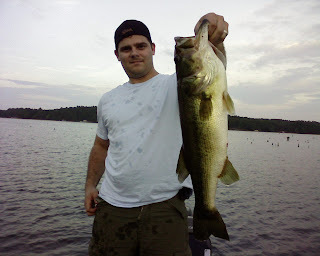 PS, I can catch fish, here is proof. This one was caught last year in Arkansas. This green beauty weighed in at eight pounds, ten ounces. This is by far the largest I have ever landed.